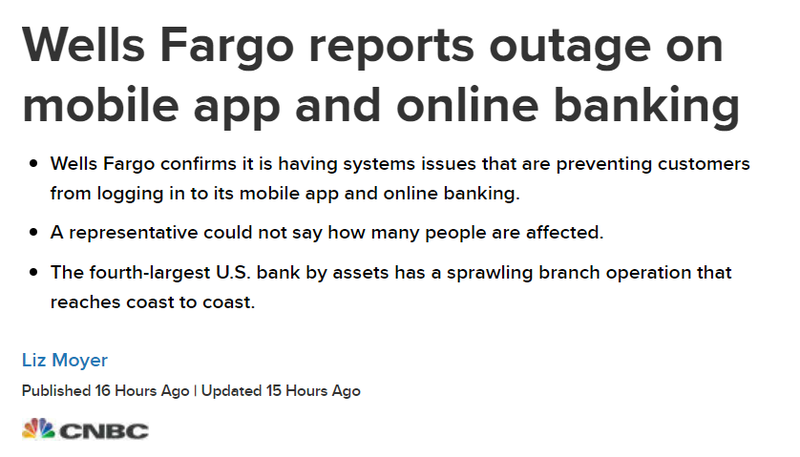 Information about the events is scarce at the moment and aside from this CNBC article that covers the tweets from @Ask_WellsFargo there's virtually no mainstream coverage of the event as official spokespeople from the bank are keeping a tight lip. The outage seems to have been caused by either a power outage or smoke (or both, it's still not clear) in one of their Minneapolis data centers. The European trading session didn't go so well yesterday. Sour data had been coming in all morning, but the EU Economic Forecasts seems to be the straw that broke the camels back. The economic forecast mentioned above is covered in a piece by Bloomberg titled "Europe's Economic Outlook goes from Bad to Worse amid EU Warning." The DAX was the hardest hit but the US handoff didn't go so smoothly and by this morning the Asian session (sans China and the other countries who are still partying) is in a depressed state. If that's not enough to spook the markets, this headline certainly didn't make things any better.